Seadoo’s pulled out the big guns with this new PWC. There’s no denying SeaDoo build innovative, high-quality personal watercraft with attractive styling – and the new 2006 RXT is no exception. The RXT is a three-person version of the popular and blindingly quick RXP. We ran the RXT at Pittwater, north of Sydney, on an unusually warm and sunny late winter’s day. The wind gods also smiled on us providing calm conditions for the test, which enabled the team to really put the RXT through its paces. SeaDoo personal watercraft are made by the massive Bombardier Recreational Products Company based in Canada. The company has a wide range of complimentary businesses making everything from Evinrude outboard engines to Bombardier ATVs and snowmobiles. With that kind of pedigree, you know they are serious about producing performance watercraft. A Rotax 4-TEC single overhead cam engine featuring four valves per cylinder with multi-point fuel injection power the 2006 SeaDoo RXT. This engine is common across almost the entire range of nine SeaDoo models with the exception of the SeaDoo 3D DI. Where the engine in the RXT differs is that this baby is supercharged and produces a whopping 215hp. This PWC weighs just shy of 400kg dry, so when you get on the gas it jumps quickly onto the plane and accelerates at a pretty good pace. Unlike its smaller brother, the RXT does carry a little more inertia into corners, but we found that once we got used to it, we were able to turn at will with minimal effort. While all this sounds big, it’s extraordinarily quiet. The noise level put out by the engine will surprise anyone lucky enough to get a test ride on one of these babies. You sit on the motor and that’s about as close as you can get without sticking your head in the engine bay, but I can assure you this thing is as quiet as a mouse. Personal Water Craft are often much maligned because of the noise they make. While this may have been true of the first generation models, these days the noise levels a PWC engine puts out is not much louder than a special someone whispering sweet nothings in your ear. 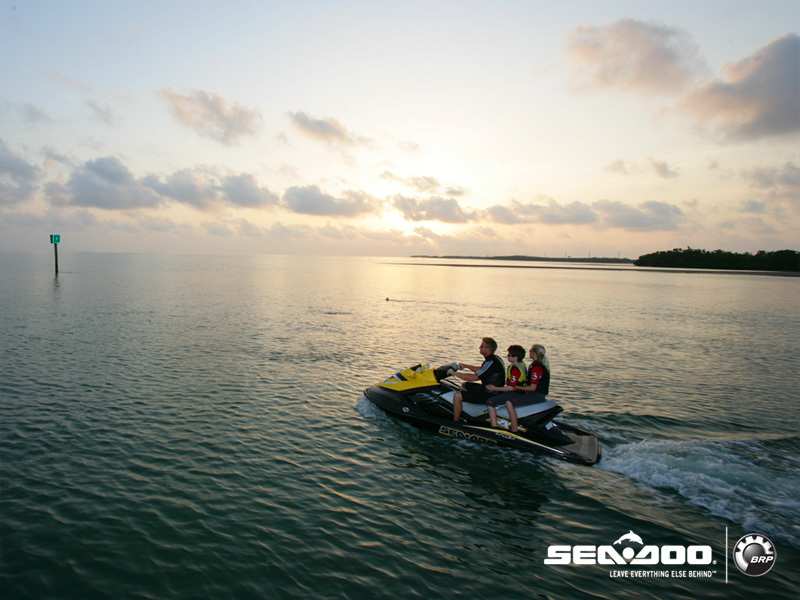 All SeaDoos are equipped with the D-Sea-Bell sound reduction system, which reduces sound levels by up to 50 per cent. This is a patented system and we’ll not go into specifics in this test, but we assure you, it works. The RXT is designed to accommodate one, two or three people and with an LOA of 331cm and a width of 122cm, it’s extremely stable at rest. It’s even possible to stand on one side of the vessel without tipping it over. This PWC has a top speed of 110kph, which, when you are sitting about a foot off the water, is damn quick. That’s only a rough approximation because it was diffi cult to see the new look dash layout through teary eyes. Thankfully, no one came off at this speed, or we probably wouldn’t be here to let you know about it. With a couple of people onboard, the RXT doesn’t give away much in performance and while some minor adjustment needs to be made to your driving, because of the added inertia and weight, there’s still an abundance of power available at your thumb tip. There’s plenty of storage space onboard for any budding family of picnickers, with a generous 199lt of usable storage space up front. There’s also a small waterproof storage locker for keys and wallets etc., in front of the riding position. The major change to the RXT this year is the revised dashboard digital information centre. In previous models the rider had to jump through diff erent modes via a push button located on the left handlebar. The redesigned layout means it’s much easier to see the numbers, as they appear on the one space age-looking gauge. In addition, all four-stroke SeaDoo models come with an exclusive learning key, which makes novice riding a breeze. The substitute lanyard comes preprogrammed to restrict RPMs, keeping top-end speed to about half full throttle. Standard on all SeaDoo models (except the 3D DI) is the Off Power Assisted Steering system, which aids manoeuvrability when the rider is off the throttle when approaching a wharf or another vessel. As with all PWCs, they are easier to control when water is moving through the jet nozzle. more than fit the bill. A Rotax 4-TEC single overhead cam engine featuring four valves per cylinder with multi-point fuel injection power the 2006 RXT. In calm conditions the RXT hit a top speed of 110kph.